It’s always fascinating to see how amazing special effects are created for movies – seeing all the incredible behind-the-scenes work that goes into the magic that ends up on the big screen. This video is a fine example – and right at the center of it, controlling all of it, is an iPad. Fxguide’s Mike Seymour details the how the upcoming blockbuster, Noah, was able to control the mechanics of a giant custom rain machine in a studio that size of two football fields with the use of a single iPad app. Also another fine example of how the iPad just can’t handle ‘real work’. I mean, movies aren’t big business right? The latest story in Apple’s ‘Your Verse’ series on the iPad is all about how the tablet is used by a pair of mountaineers – Adrian Ballinger and Emily Harrington of the Alpenglow Expeditions group. The iPad is one of the essential pieces of kit that accompanies the climbers all the way to the summits they reach. One of the most impressive things uncovered in this case study is that the iPad is used by the climbers all the way from the early planning stages of a climb right through to the final ascent. At each stage of the climb, Ballinger and Harrington reduce the gear in their packs. So as the climb becomes more difficult, they’re carrying only the most essential tools. And because it’s a crucial part of how they navigate the mountain safely, the iPad makes it all the way to the top. It’s a great piece, with lots of fascinating details on how the climbers work and how he iPad fits into their expeditions. Check it out at this iPad Your Verse page. 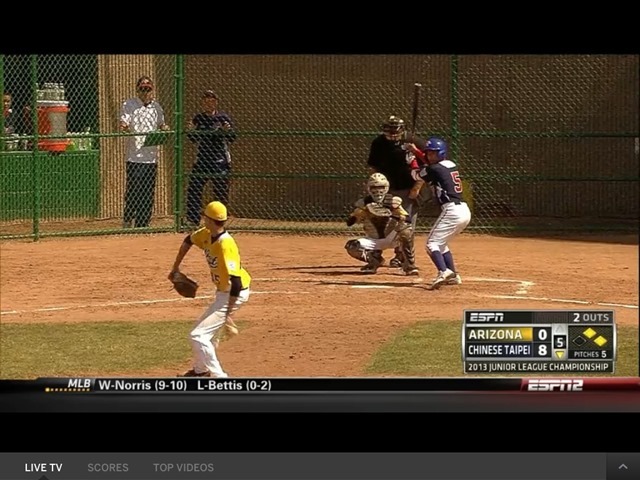 The iPad is playing a major part in one of the summer’s most fun sporting events – the Little League World Series. As Apple Insider reports, the iPad is serving as the official scoring and record recording device – used by officials during the 2013 Little League Baseball and Softball World Series. Officials will use the GameChanger scorekeeping app on 35 iPads to track stats, stream live game updates, generate batting spray charts, and more – across 9 Little League World Series events and 10 regional championships. GameChanger is an award-winning and powerful app, with an impressive set of features for scorekeepers and fans alike. I’ve written before about the iPad being widely adopted by NFL football teams and Major League Baseball teams. 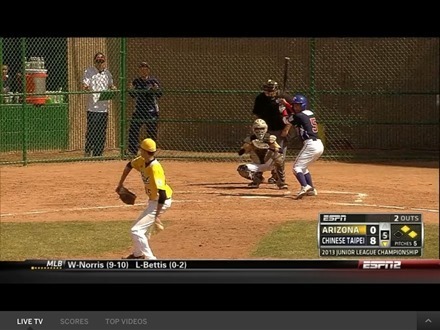 It’s great to see it being put to such good use at the Little League level too. I talk every day about the power and capabilities of the iPad, but this is a use case story that even I didn’t imagine: the iPad in use at poolside, in the pool, and running a small business that provides swimming lessons. At the Woggle Goggle Swimming School in Penrith, Cumbria they’ve built a system that lets them run every aspect of their business on the iPad – from literally in the pool to the back office. The school is run by Ben Levene and his wife Jacqueline. Jacqueline teaches all the swim lessons and Ben handles the commercial and admin side of the business. With the help of a couple of neat apps, an excellent software builder and a third party iPad product, we have built an all in one system on our iPad, which runs every single function of our swim school. 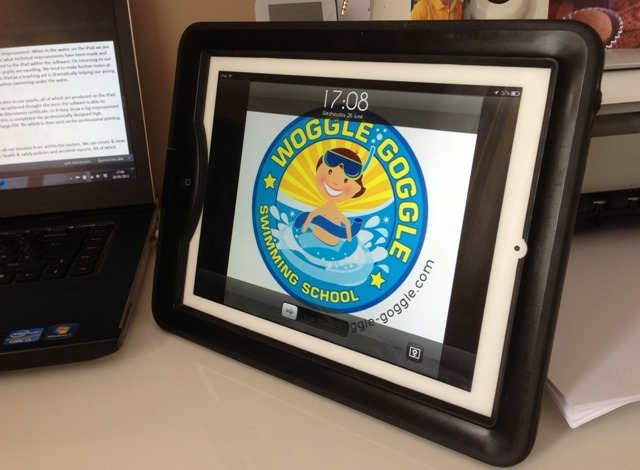 We take the iPad into the pool and are able to take registers and perform other admin duties. We can film the pupils in and under the water to help us show a pupil where they need to improve there technique. We can even test pupils, pass them for exams and even create high quality printable swimming certificates, all whilst in the pool. The same software also produces all our invoices and communicates with all our customers. 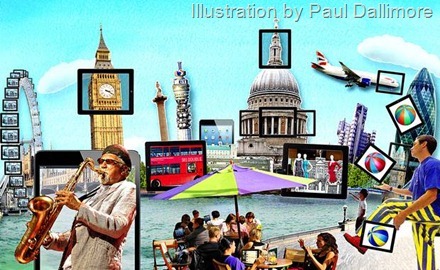 London’s Evening Standard ran a recent article focused on how the iPad is ‘powering London’. 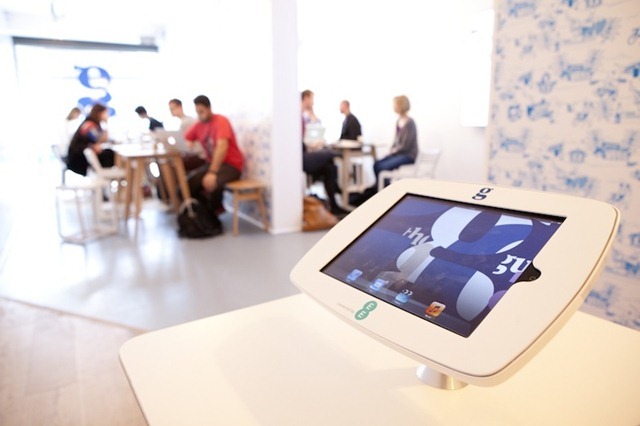 From barmen to doctors, Apple’s tablet is being used as a working tool rather than just another tech vice. The article runs down how the iPad is being put to work in all sorts of areas in London, from the music and fashion industries to education and medicine. It details how London restaurants and bars are using the iPad for a variety of purposes – from serving up the wine list to assisting with childcare. Check out the article in the Evening Standard for more detail on some of the ways the iPad is being put to work in London. Today I saw an iPad at work in a Tesla showroom here in Austin. 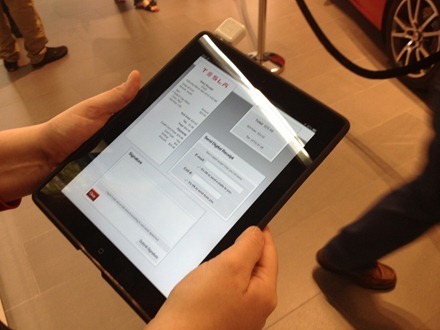 The iPad is being used as a sort of point-of-sale device – even though the showroom can’t actually sell you a Tesla in the state of Texas. My father-in-law (Dan) and I spent quite a while in the Tesla showroom today. I’m not generally a person who gets very excited about cars, but even I have to say the Tesla model we saw was nothing short of awesome. Dan sat in the car and we both ended up thoroughly impressed with it. We’ve known for some time about American Airlines’ plans to use iPads as electronic flightbags, but all the previous articles I’ve seen have been third party reports. Today I spotted a TUAW post that linked a video where an American Airlines pilot who’s been involved in the program talks about how the iPad is being used in the cockpit. This is huge, it’s a big step up for us. Why yes – that is an iPad in use on the International Space Station. 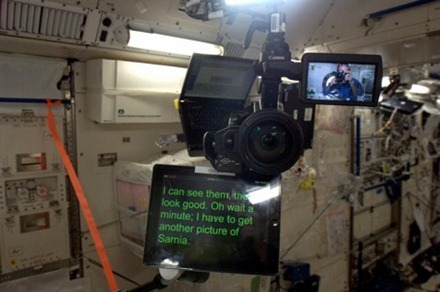 Chris Hadfield, an astronaut with the Canadian Space Agency, tweeted this image – showing his iPad in use with a teleprompter app. Apparently Hadfield also uses the iPad for entertainment – with thousands of songs in his music library. 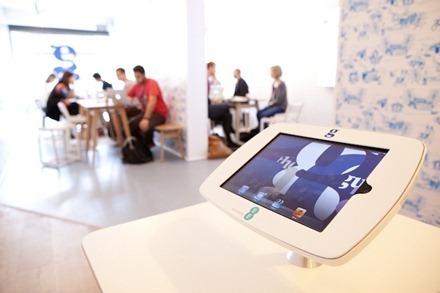 All I can say is the iPad sure gets around – enterprise board rooms, the White House, the UK’s Parliament, NFL, NBA and MLB Locker rooms, Ferraris, and now space. Nice work if you can get it. 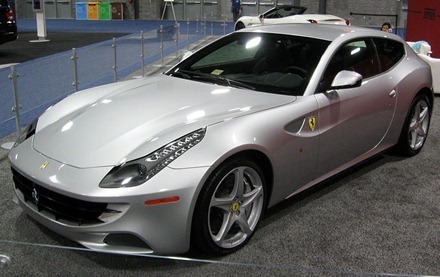 Ferrari announced this week that they are looking into extending their partnership with Apple on in-car entertainment. Ferrari’s 12-cylinder GT sports car prowess is represented at Geneva by the FF, the very first four-seater and four-wheel drive in Prancing Horse history. It will be sporting a Grigio Ingrid livery with an elegant glass roof and Iroko interior. The FF is also now seamlessly integrated with Apple technologies, thanks to direct access to the infotainment system via SIRI voice commands and the adoption of two iPad Minis as the entertainment system of choice for the rear seat passengers. Talk about nice work if you can get it. Vroom vroom iPad. Over the last couple of years the iPad has made a big impact in the NFL – being adopted by numerous teams to use as their playbook, and for scouting and a variety of other purposes. The NFL will be providing each team with an iPad application designed to help teams diagnose whether one of their players has suffered concussion almost immediately following impact, ESPN reported on Saturday. … Prior to the start of the season, and at different intervals throughout the season, the system will be used on players to perform a number of tests in order to establish a baseline score. In the event of a possible concussion, team doctors will use the app to evaluate players, and the app will compare their post-hit results against their established baselines. A large discrepancy could indicate that the player has suffered a concussion, and the protocols for such an injury would go into effect. 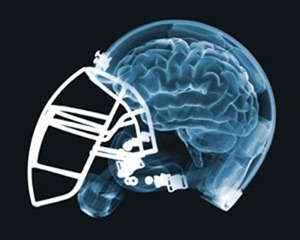 Concussions and head injuries in the NFL have become a very hot topic in recent years, and rightfully so. It’s great to see iPads being used for this purpose and to see the NFL using technology in their efforts to better protect players.